An ingrown hair occurs when a short hair curls and begins to grow back into the skin. The condition primarily affects black males between the ages of 14 and 25 according to the MayoClinic.com. Women who shave their pubic hair also are prone to ingrown hairs. Infection targets the follicles and is referred to a folliculitis. Tweezing, shaving and electrolysis can lead to ingrown hairs on tightly coiled hairs. Take oral antibiotics and apply antibiotic ointments prescribed by your dermatologist or family doctor. Utilize drying agents to reduce the inflammation and help to clear up the infection. Antiseptic lotions commonly used to treat folliculitis include aluminum chlorhydrate preparations. Place a hot moist washcloth over the infected area and allow it to stay there until the cloth cools. The heat eventually will promote drainage an loosening the hair, promoting healing. Removing the hair also prevents further complications and continued infections, according to MedlinePlus. Wash the infected area with antibacterial soap twice a day using a clean cloth every time. Do not scrub. Use a fresh towel to pat dry the infected skin as well. Stop shaving for at least three months if you experience chronic or frequent infections from ingrown hairs. According to the American Osteopathic College of Dermatology, you need to allow the hair to gain sufficient length and strength naturally to stop the hairs from curling into the skin and causing infection. Antibiotics are ineffective when applied too often. Wear loose clothing that won't rub or chafe on the infected hair to ease the discomfort while it heals. 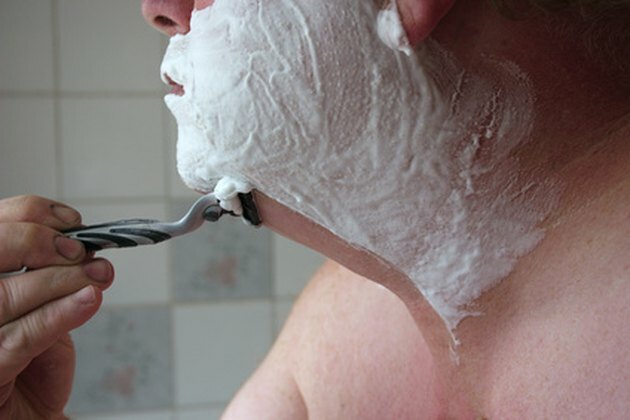 Use a clean blade when shaving if you're prone to ingrown hairs and shave in the same direction that the hair grows. If not properly treated, infections caused by ingrown hairs can travel to other parts of the body. See a doctor or dermatologist for treatment if the ingrown hair becomes red, warm and tender to the touch. Avoid pools and public hot tubs if you have an ingrown hair as it can easily become infected from bacteria in the water. Don't share towels. Don't wear the same clothes after they have touched the infected skin. Wear clean clothes every day to avoid spreading the infection.